Russell Finex will exhibit at the 7th edition of Solids (Schüttgut) in Dortmund, Germany. The show is the last of this year’s Solids European Series and will take place on 4th and 5th of November at Westfalenhallen in Dortmund. This leading trade show for powder and bulk technologies will again be co-located with the Recycling-Technik show. Proven to be a success at the previous two editions this show dedicated to recycling technologies will now have its own dedicated exhibition hall for the first time. At Schüttgut professionals are able to meet over 450 exhibitors covering the entire spectrum of process engineering for granules, powders and solids technologies, as well as recycling, environmental technology and urban mining. Russell Finex, worldwide suppliers of sieving and separation equipment, have over 80 years of experience in the business and are proud to present their innovative range of vibratory sieves and separators. At Schüttgut Russell Finex will show a working demonstration of the Finex Separator™ with Russell Gated Outlet™, the Russell Compact Airlock Sieve™ and the Russell Compact 3in1 Sieve™. Plan your visit to Schüttgut in Dortmund and come by the Russell Finex Stand F07 in Hall 4 to see this sieving and separation equipment in action. A team of separation specialists will be available to discuss your specific application or needs. With over 80 years of experience within an array of industries Russell Finex are confident to hold the answer to your separation requirements. The Russell Gated Outlet™ is one of Russell Finex’s latest innovations and has been designed to control oversize and product flow. This upgrade is a pneumatically controlled gate installed in the outlet of the sieve deck. 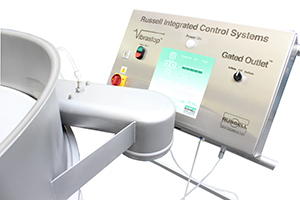 By inflating or deflating the Russell Gated Outlet™ a complete control of product flow and oversize discharge is provided. Applications where there is little oversize or where powders or granules are discharged too quickly would benefit from this control device in order to minimize loss of good product. This oversize and product flow control device can be retrofitted onto Russell check-screeners and grading sieves including the Russell Compact Sieve®, Finex Separator™ and Russell Eco Separator®. At the show the Russell Gated Outlet™ will be demonstrated on the Finex Separator™, a multi-deck vibratory separator. 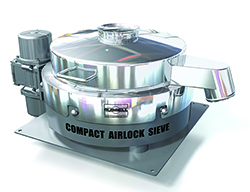 Another innovative product on display is the Russell Compact Airlock Sieve™. This vibratory sifter is the first of its kind and uses a pneumatic clamping system instead of traditional quick release clamps. This patented pneumatic clamping system offers a high product containment and provides an Occupational Exposure Level of less than 1µm/m³ (OEL5). This vibratory sifter is sealed by placing the component parts into the base and locking them by twisting the lid. Once the machine is closed an inflatable band clamp locks the components into place. The Russell Compact Airlock Sieve™ is ideal to screen hazardous powders and granules and protect operators from harmful dust. Watch this vibratory sifters animation to see full assembly and dis-assembly and discover how this machine functions. The Russell Compact 3in1 Sieve™ has specifically been designed by Russell Finex to screen raw materials which are supplied in bags. This machine has three main features including a bag dumping station with an integrated dust hood, the Russell Compact Sieve® technology and a magnetic separator. 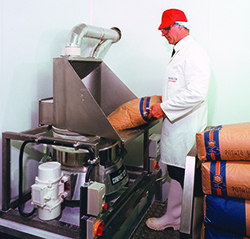 The bag dump platform is at an ergonomic height and can be connected to (existing) dust extraction systems through the integrated dust hood, safeguarding both the health and safety of operators. Benefiting from the Russell Compact Sieve® technology, high capacity safety sieving and an accurate sieved product are guaranteed. With a magnetic separator in place magnetic particles are trapped to prevent them entering downstream into your production process. The Russell Compact 3in1 Sieve™ has often been used for the safety sieving of flour within (industrial) bakeries. Follow us on Twitter or Linkedin to receive regular updates on Russell Finex's latest product innovations.